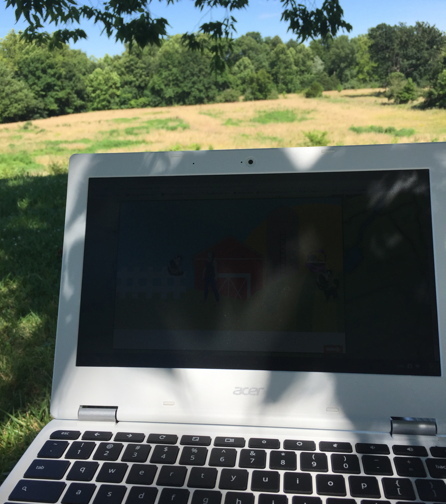 Home » Blogs » AnnMaria » Who Does Game Testing in a Corn Field? people think I am speaking metaphorically. 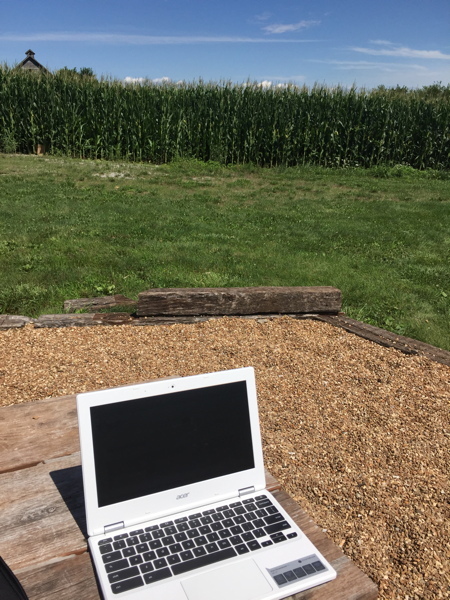 Picture of me testing below on a Chromebook next to actual field of corn. I’m not actually IN the picture because I’m taking it. There weren’t a lot of people passing by to ask and I’m not much of a selfie queen. 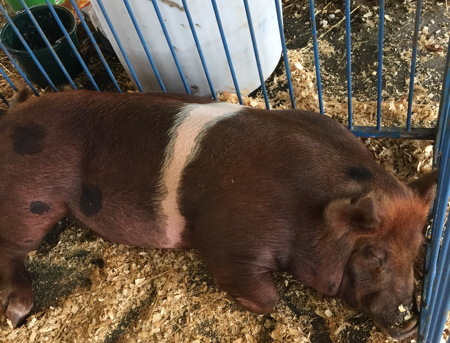 I tested the games next to another field somewhere east of Warrensburg, MO.Parked on the side of a gravel road, I tested Forgotten Trail again, near this guy, at the Johnson County fair. According to my GPS the nearest town was Centerview, MO (population 267). while eating dinner by the side of a creek in Hermann, MO (population 2,431). Why? We’re funded by the U.S. Department of Agriculture to develop educational games that can be used in rural communities and I take that very seriously. We had a teacher who was a pilot tester in a small, Missouri town who reported major issues with using Forgotten Trail and Aztech over the wi-fi. Since I was already in Missouri on an unrelated project, I just stayed a couple of extra days and criss-crossed the state doing performance testing. Logically, the only way to determine whether the issue was the hardware (Chromebook), software (our games) or the network capability was to test the games using varying hardware under varying network conditions. So, I packed a Chromebook with my Macbook and headed out. Well, it works on my computer. The result – so far, Forgotten Trail has passed with mostly flying colors. The only problem I had was that occasionally the internet dropped. There is nothing we can do on our end about that. If your school has decided to use hardware (Chromebooks) that run apps off the internet you need wi-fi access. One decision I did make as a result of this experience was to increase the frequency and amount of data stored in local storage so if your connection does drop briefly you get put back into the game pretty much where you left off. If you’d like to check out Forgotten Trail for yourself, to brush up on your knowledge of middle school math and truly be smarter than a fifth-grader in all things, or to give to a child or school, check it out here. RUNS ON MAC, WINDOWS OR CHROMEBOOK COMPUTERS. You don’t need to live by a field, but if it just so happens that you do, I can guarantee it will work.